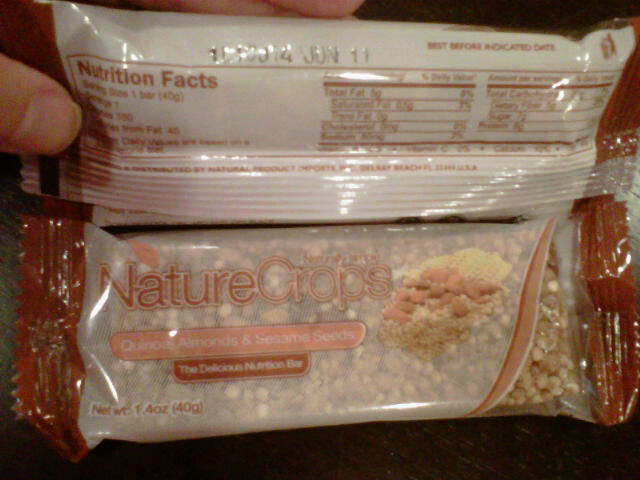 At one of my races I received this quinoa and almond bar. I always look at the nutritional facts to make sure these bars have protein to calm my hunger when eating them as a snack. To my surprise these were not bad at all. A good source of carbs and protein but with low sugar! I only eat these when I want something different for a snack and also only when I know I’m running as they are high in carbs. Here’s the bad news… I searched for them online to know where I can buy more and found out they do not sell the in the U.S.!!! I’m so sad! On their website it does say they are coming soon. Keep an out for them as it was a great and tasty option. My only thought was, why in the world would they give them out at a race when one can’t buy them??? Hehehe… Oh well maybe I can do some research on making my own quinoa bar!